How nice it felt to reach the shade of the pine trees. The rays of the hot California August sun had been cooking the skin on our exposed arms as we drove through the valley of sagebrush. Now the shade from the trees lowered the temperature and only occasionally was the sun able to reach us. We slowed our ATVs as we reached the narrow dirt road which would lead us to the mountainside we had planned to hunt that evening. It was 4 p.m. on the second day of the 1991 archery season in the X6 Zone. 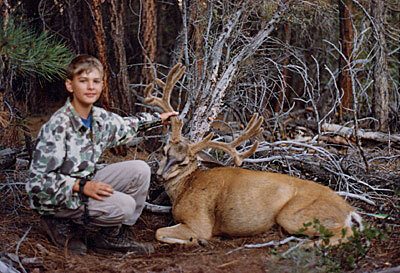 This was my son Scott's first year deer hunting. I noticed a smile on his face as we drove side-by-side over the rough road. I wasn't sure if his smile was because we were out hunting or because he knew he had a week to drive the ATV, or both. The road we were now on paralleled the lower slope of the mountain. It cut through the mountain's large strips of pine trees, open areas strewn with boulders, and sections of manzanita and buckbrush. We were within a few hundred yards of our stopping point when something caught my eye in the shade of an open area on the downhill side of the road. Was it just another rock or bush that looked like a deer? I stopped the ATV and raised my binoculars. It was a deer  in fact, a nice forkhorn mule deer, standing in the late afternoon shade next to a large juniper tree. By this time, Scott also had stopped. I quickly located the other deer. Sure enough, it was standing off to the right of the first deer about 40 yards. Both deer were a good 125 yards downhill from us. I thought the second deer was a doe until I took a closer look. It was another buck, either a forkhorn or a three-point, I couldn't tell for sure. Just as Scott and I got ready to drive up the road so we could plan a stalk, the first deer started to walk down the hill and the other quickly followed. We then got the surprise of our lives as, all of a sudden, another deer with a rack that a blind man could see stood up and trotted to join the other two. The velvet on its antlers made it look as if it had a large bunch of cattails on its head. This deer made the other two look like yearlings. All three deer worked their way down the hill about a hundred yards and then angled off into a narrow strip of pine trees which ran from the base of the hill past us and on up close to the top of the mountain. With the deer now out of sight, we discussed our plan of action. We decided to try a stalk down an old overgrown logging road which was on the opposite side of the strip of timber and which ran parallel to it. Small pine trees, manzanita, weeds and grasses covered much of the road but the tire lanes would allow us a somewhat quieter approach than stalking through the woods. We drove our ATVs a few hundred yards farther and parked them near the head of the abandoned logging road. After pulling my bow from its rack, I wiped the sweat from the palm of my left hand  I wanted to be sure my hand wouldn't slip on the bow if I got a chance at one of the bucks. As we crept down the road I felt the tension from the excitement taking over my body. I kept telling myself, "Pick a spot. Pick a spot." How many times at the last moment had the excitement of the hunt caused me to shoot at the whole deer, only to see the arrow miss? Would the size of the big one's rack cause me to shoot through its horns, because that's where I would be looking? As I glassed the brush and the trees for any sign of the deer, I continued to say, "Pick a spot." Scott was right behind me lifting his boots so he could step in my footsteps, except for the ones which had snapped a twig or rolled a stone. Farther down the road, patches of broken manzanita and other brush kept most of the pines 25 to 50 yards from its edge. The cover ranged from a few feet tall to a height of at least eight feet. Just as we reached the area, the bucks broke from their hidden positions. My instincts and the thought of the big buck caused me to draw the bow the instant I heard the crack of the brush and saw the flash of their light brown coats. The two smaller bucks broke uphill to my left and the big one went downhill to my right. The deer did not take off at a run but did what many do during archery season  they just went far enough to put some objects between us and them. Wow, what a rack! He had his head down, feeding away from me at about 40 yards. Buckbrush was partially blocking my shot but in two seconds he gave me a quartering-away angle. That was all it took  I quickly put my pin between his right front leg and right hindquarter and released. The arrow was flying right at him. The next thing I knew, that beautiful rack was attached to a rocket blasting downhill through the pine trees and buckbrush and in a second he was out of sight. I was suddenly filled with mixed emotions. I had gotten a shot at a trophy buck, but did I blow it? "Dad, did you get him?" Scott said in an anxious voice. "I'm not sure," I replied, "I didn't see the arrow hit." While I went to check for my arrow, Scott worked his way slowly back up the road to see if the other two bucks were still in the area. I visually marked the spot where the buck was standing when I shot and followed what should have been the arrow's flight path. As I got close to the spot, the brush seemed thicker than I remembered. Could a branch have deflected my arrow? Did I really miss a California buck of a lifetime? I saw no sign of blood where the deer had been standing and no sign of it while following his tracks to the trees. It was only 20 yards behind the buck that pine trees had made a thick bed of pine needles. I began checking those for signs of my arrow. I knew I had a problem if the arrow had slid under all of those needles. It could be there and I still might not find it, then how would I know if I'd hit him or not? After five minutes of searching without finding it, I decided to follow the buck's tracks as far as I could, just in case I had connected. The ground in some spots was soft enough for the buck's big push marks to show, making it easier to determine the actual ground he had covered. After slowly examining every inch of ground for about 35 yards, I spotted what looked like a small spot of blood no bigger than half the size of a dime. I marked the spot with a piece of white toilet paper and went back up the road to get Scott. Sometimes it is very difficult to determine the difference between blood and some other natural substances found in the woods but Scott and I had a new tool in our hunting kit that year  hydrogen peroxide. Yes, the same stuff you put on cuts and scrapes. One spray on blood, whether it is old or fresh, and it foams white bubbles. I have found nothing else in the woods that will do that, so it is a great aid in tracking wounded game! "Dad, it's blood!" Scott said the instant we sprayed the small spot. I had hit the big one! Once again an emotional roller coaster. I had hit it, but was it a good hit? I nocked an arrow as Scott and I slowly walked on each side of the trail looking for more blood and hoping we were following the right path as the tracks came and went. My arrow must have hit a branch and just nicked him. My head was down, my eyes examining every spot on the ground when suddenly Scott said, "Dad, there he is!" I looked up expecting to see the buck racing away through the trees but instead he was slumped on the ground with his massive horns perfectly cradled between the trunks of an old buckbrush tree. At this distance the size of those velvet antlers looked massive. After taking a minute to make sure the buck was dead, we both lost all self control and did a couple of high-fives and a yell or two. The adrenaline was really pumping and you couldn't have wiped the grins off our faces. It was a great moment for a father and son to share. After checking the buck, we discovered the arrow had entered the back of the right hindquarter. It had cut the artery along the backbone, causing him to travel only 70 yards before blacking out. Not another drop of blood was on the trail. His rack was 26 1/2 inches wide with five points on one side and six on the other. We were able to drive my ATV right up to the buck. In order not damage the velvet, Scott carefully held the antlers as I struggled to lift him onto the back of the ATV. After three attempts I finally got him onto the back rack. As the commercial says, "It doesn't get any better than this." Bow: Oneida Strike Eagle - 68 lbs. 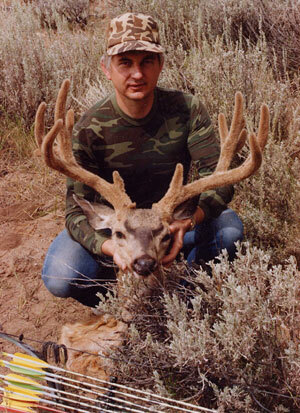 Note: This deer won the Big Buck contest at Frontier Archery, Sacramento, California in 1991.